3. Never touch the trap with your hands once it has been set as you might injure yourself. It is advisable to use a stick or other tools if you want to release the trap for safety purposes. Rotate the bait cup to 90 degrees and take it out. Place the bait, like peanut butter, chocolate, cheese, jam, etc. Put back the bait cup. Press the rear of the trapper until it clip with the ground side. Put the mouse trap to places where mice usually go through. 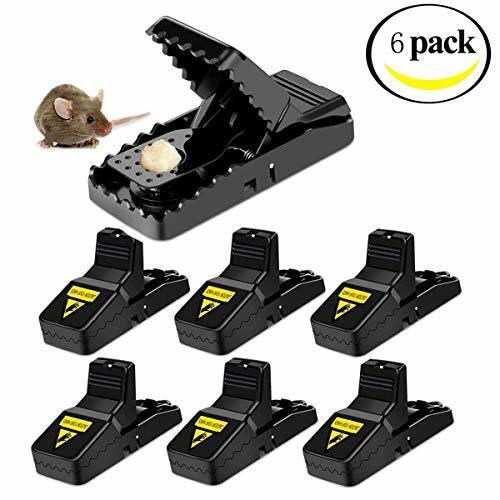 ensitive and Effective-comes with improved rodent killer, 6 Pack,Ideal for Mouse Trap.With 1 Cleaning Brush. If you have any questions about this product by HiSayee, contact us by completing and submitting the form below. If you are looking for a specif part number, please include it with your message.